The Bodice Project is pleased to be exhibiting at the Oglebay Institute’s Stifle Fine Arts Center https://oionline.com/stifel/ February 28 - April 19. The exhibit is a collaboration celebrating The Art Of Healing. We are very excited to announce an exhibit on the WVU campus, in association with the Health Services Center! Building awareness through art and science! In honor of Victoria Parson Smith, and our Bodice Models in the Charles Town and Harpers Ferry area, The Bodice Project is pleased to announce an exhibit at the new Charles Washington Hall, Charles Town. The American Association for Cancer Research (AACR) has invited The Bodice Project, a local non-profit organization, to be part of its national conference in Chicago in April 2018. Exhibiting at the AACR conference will afford twenty-one thousand cancer researchers and additional lay public the opportunity to view and experience the transformative nature of The Bodice Project sculptures. The Bodice Project was the concept of Shepherdstown artist/activist Cynthia Fraula-Hahn. Fraula-Hahn felt that women and men undergoing mastectomies needed a pathway to accepting and even celebrating their bodies in the aftermath of cancer. Impassioned with this idea, Fraula-Hahn and other local artists partnered with breast cancer survivors to tell their stories in three dimensional works of art. Since its inception in 2014, the mission of The Bodice Project has gained wide recognition and support throughout the region. Dr. Mary J.C.Hendrix, President of Shepherd University and a nationally recognized cancer researcher, has acknowledged the exhibition’s beauty, message and importance during exhibits at Shepherd University. Shepherdstown, WV. (March 10, 2018)- Shepherdstown, WV. 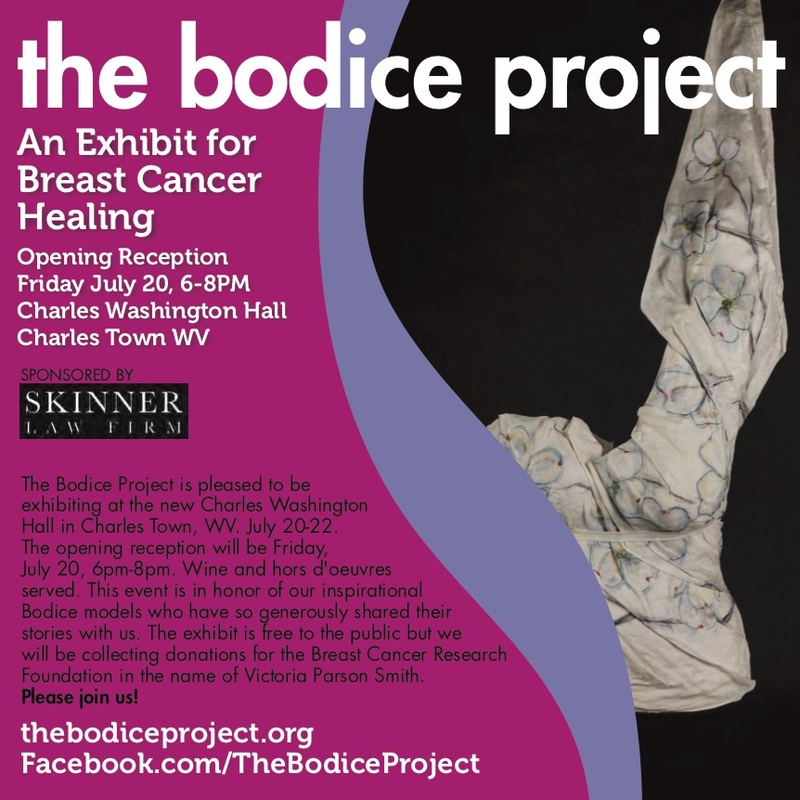 The Bodice Project (TBP) is a sculptural exhibit that focuses on the emotional healing and support for women and men facing the challenges of post breast cancer. We are hosting a RAFFLE fundraiser for their trip to exhibit at the American Association For Cancer Research (AACR) conference in Chicago in April 2018. The RAFFLE is located at Town Run Brew Pub from March 6 – April 7th. The winner will be announced at the Town Run Tap House in Shepherdstown on April 7 before a live audience at 8:00pm. The Bodice Project board of directors and friends will be at Town Run Brew Pub at 6:30 p.m. The Bodice Project brings together artists, breast cancer survivors, patients and the public in a unique and meaningful way. Artists from the Mid-Atlantic area have created torso sculptures, some of actual women and men who have undergone mastectomies or reconstructive surgery. When presented to the public these beautiful works evoke a range of emotion, from empathy to solace. "I loved seeing the wrap when it came off because I looked at it and I thought, 'wow, that's me! And it's really beautiful!' I was struck suddenly that I'm still pretty. That doesn't happen all the time," an anonymous breast cancer survivor said. Raffle tickets can be purchased at the Town Run Tap House in Shepherdstown between March 7 and April 7. Proceeds of the raffle will be used for expenses such as building the pedestals and containers, renting vans for travel and storage facilities to house the art works, as well as covering the numerous expenses incurred in moving and mounting the exhibit. No monies will be used for any travel expenses for those who are staffing the exhibit in Chicago. TBP also has a campaign at GofundMe.com/TBPtoChicago for donations. Every $10 donated will be assigned a raffle ticket number. You will be entered in our raffle! 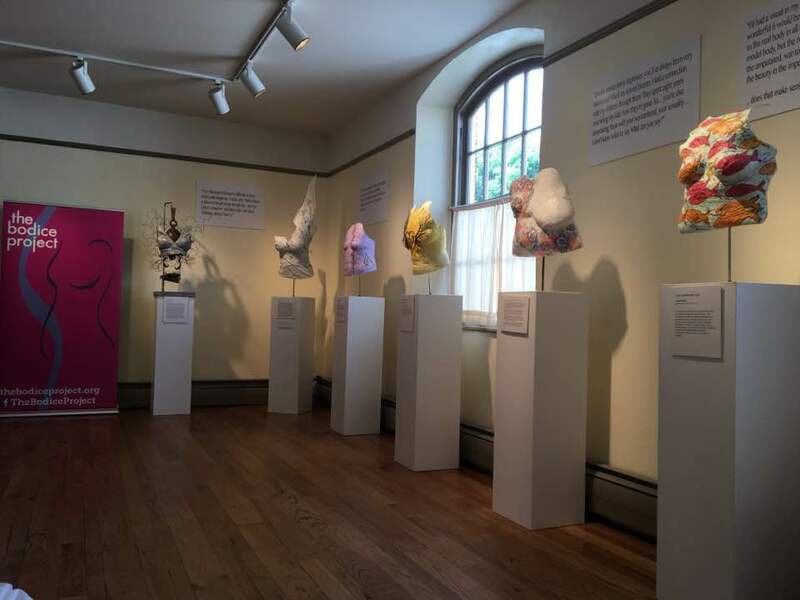 The Bodice Project is a not-for-profit sculptural exhibition that promotes emotional healing, through the arts, for women and men facing the challenge of breast cancer, and life after treatment. 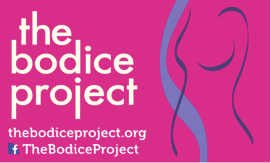 Learn more at TheBodiceProject.org. SHEPHERDSTOWN - The American Association for Cancer Research (AACR) has invited The Bodice Project, a local non-profit organization, to be part of its national conference in Chicago in April 2018. Exhibiting at the AACR conference will afford more than twenty-one thousand cancer researchers and lay public the opportunity to view and experience the transformative nature of The Bodice Project sculptures. The Bodice Project was the brain-child of Shepherdstown artist/activist Cynthia Fraula-Hahn. Fraula-Hahn felt that women and men undergoing mastectomies needed a pathway to accepting and even celebrating their bodies in the aftermath of cancer. Impassioned with this idea, Fraula-Hahn and other local artists partnered with breast cancer survivors to tell their stories in three dimensional works of art. Please join a celebration featuring local bands, hors d'oeuvres, and refreshments on October 21, from 7 to 10 pm, at the Shepherdstown Community Club (102 East German Street). There is NO COVER for this event! please visit www.TheBodiceProject.org , facebook.com/TheBodiceProject, or email cfraula@me.com. The Bodice Project is honored to install several pieces at the Winchester Medical Diagnostic Center for their October Breast Cancer Awareness Month! October 27, 2016 The Bodice Project has been invited by Women For Shepherd University, which is sponsored by Shepherd University Foundation Board, to exhibit at Popidicon, the traditional Shepherd University president's residence. The reception is October 27: 7-9pm. Please rsvp if possible by Oct. 21 to mpeterso@shepherd.edu. The exhibit will be open Oct. 28: 5-7pm, Oct 29: 1-4pm, and Oct 30: 1-4pm. 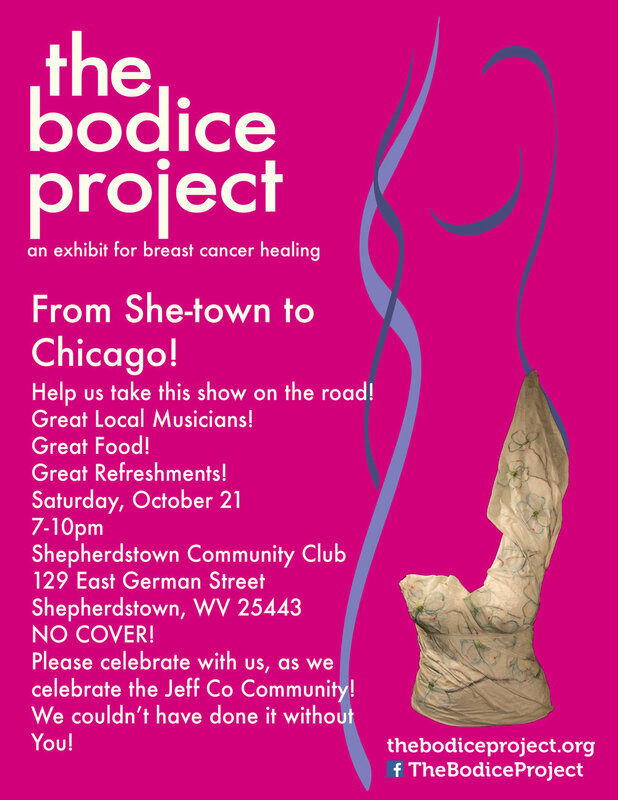 The Bodice Project will have a booth at the Shepherdstown Street Fest! The Shepherdstown Street fest will feature arts, crafts, fashion, food and beer vendors, as well as free live music! Stop in and see us! Learn about The Bodice Project and become a volunteer or supporter! Hagerstown Community College will feature the mixed media art exhibit Bodices for Goddesses at the Kepler Gallery from October 5th through the 30th. In conjunction with the fifth IDENTITY CRISIS, 2014, an annual fundraiser in Shepherdstown, WV, the Bodices for Goddesses project was conceived by artist Cynthia Fraula-Hahn and began this year. Fraula-Hahn used plaster embedded gauze to wrap the torsos of local women, several of whom have had mastectomies. These plaster works were then enhanced with paintings and other "beautifications".